The morel sighting maps are a great way to help each other out a little bit. Some refer the maps as the morel progression maps and they have always been a favorite. 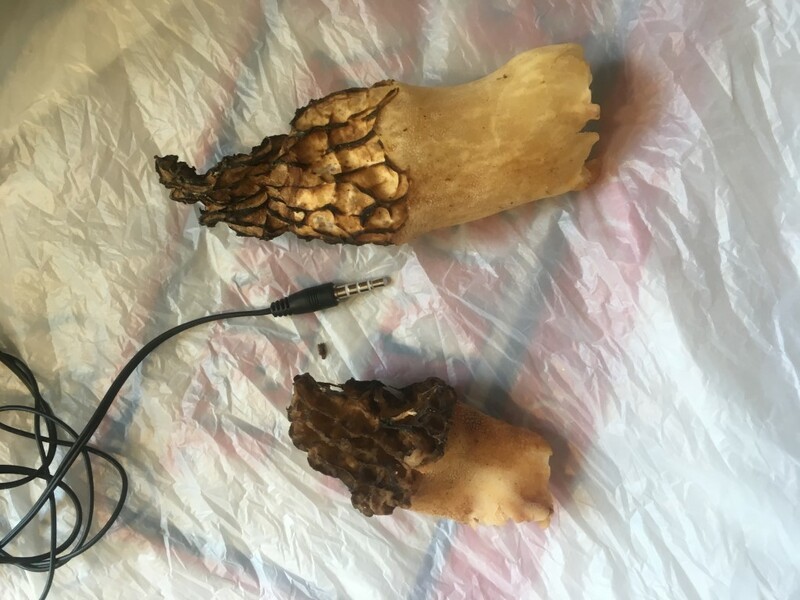 The Great Morel is often asked “is it time yet?” or “are there morel sightings in my neck of the woods?” A great resource on when one might begin their foraging adventure. Below are the new and improved interactive Sightings Map which were incorporated in 2017. There are also seven years of the old fashioned Historical Sightings Maps below too. If you would like to submit a sighting, the guidelines are pretty simple…Zip, City, State and date found. If you want to add any additional information such as county, weather, or an image that is fine. Sightings will be posted daily during prime morel season. The 2019 Morel season has arrived! The first sighting of the season was reported in mid January with what some might refer to as a “landscape morel” – it goes without saying – the 2019 map is officially is open for business! The Southeast region is winding down with the overall feeling of a pretty good year in 2019. The reports coming in from Virginia and Missouri in the middle weeks of April are super positive too. IN, IL, KS, OH, PA and WV are kicking in with the weather being much more cooperative thus far. Many of these folks in the northern parts of these states are getting ready and gearing up. Needless to say, it is game on for a lot of shroomers right now in many regions! The Great Morel would like to thank each and everyone of you who contribute to help make the sightings maps the place to report! May everyone continue to have success if you are finding them now, and for those who are waiting, don’t forget to visit The Morel Store for those special occasions and gift ideas for the Shroomer in your life! There are plenty of features on the new interactive map – zoom, filter by month, full screen and more. Below the map you can find a table listing of the most recent sightings along with images and notes if they were sent – there is a “more pages” button at the bottom of this table. Sighting, Media outlet linking to your site etc. So our local Fox station linked to this site, I took screenshots of their story, and I think I know the origins lol. That Morel was found today alog with 20+ others. Thursday Friday should be great. Excellent season ahead. Perhaps as good as 2000. I hope Fox2now(dotcom) fixes their story. Happy hunting! St Louis areas that are great to hit: Spanish lake, Sue Passage park, the lowland green areas of Meramac river, Babler park, Mo Bottoms/Columbia. Confirmed finds in all areas. Morels April 10 2019. In my yard south side of the house 2nd year then come up. Its interesting that most of the May Apples were not even open and yet the morels are pushing thru. Saw at least 20 little ones, less than an inch in height..ill let them grow a few more days! Rison, AR on the map. May be the first ever reported for Cleveland County 4/8/2019. Was visiting my brother a few weeks ago and figured we could give it a try. We found 22 that day and they have found even more since. Still waiting for them to show in Northern Iowa. I found a nice amount of some pretty nice sized ones Monday the 15th and today. Monday was especially special because my sweet 3 month old son Elvis was with me and “found” the biggest one of the day! Today I found not quite as many but this seems to be prime time in my area so I’m definitely going to keep looking after tonight’s rain. Lots of small grays. Season has just started. Early season, moist, steep land near mountain stream. Scrappy,with old fallen trees and brambles. Most of these were in one area! It’s been very warm lately; highs in the mid 70s. Found a few on Sunday before some heavy rain but most were small. Went up the mountain today on a south slope and they’re up but still small. The season looks promising in Montgomery county. Bagged some yellows! Clear to hazy. 68 degrees. Right after tax day. Scattered singles. Some near each other but no tight groups. We’re just happy because it’s the first time we’ve been up at our mountain place at the right time. The kids first finds! Sunny, 77 degrees. Found on south facing creek bank under a sycamore tree. Lucky find! Were in the shreds of an elm tree that was removed last year. Sunny warm day, April 17 2018. My first time finding them and eating. First good find of the year. 12 morels. Yay!!!!!! The 2018 Morel season has left us! The first sighting of the season was reported in the early part of March and the last was reported in June. All in all it was a good season for most morel hunters even with the odd spring weather which did create havoc for a lot of folks. The Great Morel’s recap in detail of the 2018 Morel season can be found here – 2018 summary of the various regions. The Great Morel would like to thank each and everyone of you who have contributed this season to help make the sightings maps the place to report! May everyone have wonderful off-season and don’t forget to visit The Morel Store for those special occasions and gift ideas for the Shroomer in your life! Late spring, high temperatures 80's and 90's. was pleasantly surprised when I found these. They are small and a bit dried out, found under dead elm tree, flat area with violets grasses and dandelions. Much dryer spring early on, not much rain to help out the black morels. White morels should be popping up after this weekend’s rain. Found a total of around a couple dozen black morels in our spots, not as plentiful as last year. Pheasantbacks are already up, and should be picked as soon as possible. The younger the better, and they get too tough when they’re old. The morel sightings reports were really good for most in the 2017 season…from the early southern morel hunters to the northern parts of the US. Reports from the northern Midwest States were good with the weather seeming to cooperate for most people. As the great morel made its annual migration, Michigan, Wisconsin, Minnesota, Ontario and those way up north were saying “its all good” too. New York was blessed with a good year as well. For most in PA, OH, IN, IL, and Iowa it was pretty much a better than average year. The Pacific Northwest continued to have an above average year too. 2017 for most may be one of the best overall years many have seen in some time with Mother Nature lending her cooperation along the way. Hood River County - Found Morels today at about 131 feet above sea level. The average temperature for the last 3 days has been around 66 with the low around 45. Click button below to submit sightings. Sightings will be posted to the map daily during the prime morel season. Please make sure you enter a Zip, City and State as all sightings will be categorized by one or all of these three (3) locations identifiers.